Our transformation has not gone unnoticed—Acquire BPO’s fast-paced growth and full transformation from contact centre to business process outsourcing has been recognised with two awards from this year’s 15th Annual International Business Awards (IBAs). 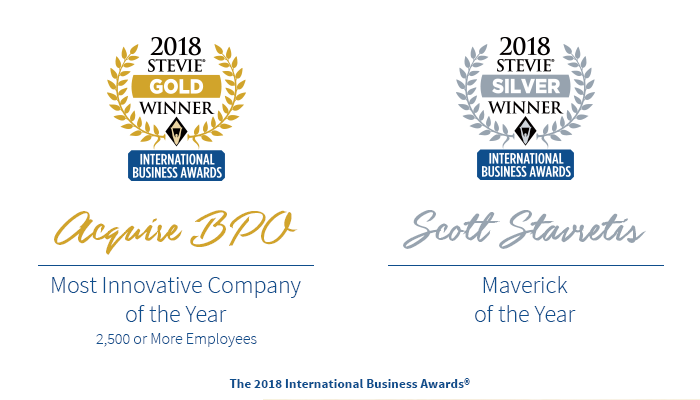 The Stevies IBA is the world’s premier business awards program, honouring organisations of all types and sizes and the people behind them. The 2018 IBAs received more than 3,900 entries from 74 nations. The awards will be presented to winners at a gala awards banquet at the InterContinental London Park Lane Hotel in London, England on 20 October. To view the entire list of categories and winners, click here.